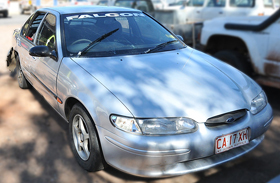 Alice Springs police say they are seeking information about a silver Ford Falcon confirmed as the vehicle used in both a road rage incident on Wednesday morning and a hit and run incident later that night. Senior Sergeant Darrell Kerr says the rear back window is broken and had plastic sheeting over it and there is a Falcon sticker on the front windscreen. “Police would like anyone who saw this vehicle anytime on Wednesday 21 March to contact them on 131 444 or call Crime Stoppers on 1800 333 000,” says Senior Sergeant Kerr. In the road rage incident, the car followed the alleged victim’s car from the Wills Terrace / Stuart Highway intersection and cut them off just before the St Philip’s College intersection at 10.15am. “Three women got out of the Ford and allegedly started smashing into the victim’s car with car jacks and a cooking pot,” he said. “Later that night a 58 year-old man was allegedly struck by the same Ford Falcon at the Northside shopping centre carpark at around 8.30. 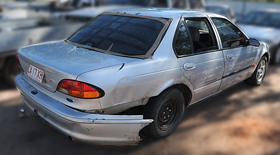 “The vehicle left the area and was later found abandoned in Priest Street, Braitling.